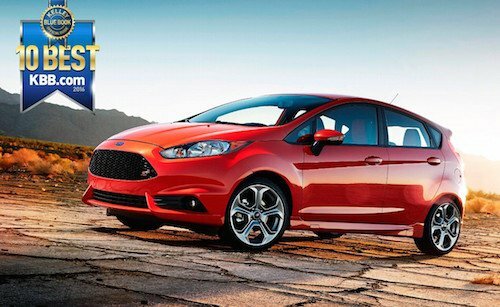 2016 Ford Fiesta Makes KBB’s Coolest Car List - Again! 2016 Ford Fiesta Makes KBB’s Coolest Car List – Again! The new 2016 Ford Fiesta has once again been named among the “ Top 10 Coolest New Cars Under $18,000” by Kelly Blue Book. This is the sixth time in seven years that the Fiesta has been included on the list. The Ford Fiesta has become one of America’s most popular small cars. It offers nimble handling, a comfortable ride and a remarkable value with a base MSRP around $14,000. The appealing value of the Fiesta combined with its advanced Ford communications and entertainment system with voice recognition, has earned the Fiesta the latest “cool car” title. Cars that make the KBB list must also be fun to drive and own. With record sales for this model last year and possibly again this year, it is safe to assume people love this sporty compact. The new Fiesta is available as a sedan or hatchback. It is powered by either a 1.0 or 1.6-liter EcoBoost engine for maximum fuel efficiency and a surprising level of performance. Our Ford Dealership has a great selection of new 2016 Ford Fiestas near San Francisco, CA. We invite you to come in and test drive this cool new car soon.